Set in the late 1800s, this story focuses on a young girl named Lily. She and her family are immigrants from Ireland, now living in New York. Her family came to the United States for a better life and for freedom. As Lily’s community awaits the arrival of the Statue of Liberty from France, they must raise money for the pedestal so that the statue can be reassembled and displayed in America. At school, Lily's teacher explains the symbolism of Lady Liberty's crown. The seven rays on the crown stand for the seven seas and the seven continents of the world. The students are also donating their money to the pedestal fund. In order to raise money, Lily seeks work and completes small jobs around her neighborhood. She realizes that the freedom of America does not feed people. Immigrant families are still facing the issues of poverty and hunger. Lily works hard to raise money for the pedestal because she is excited as she awaits the Statue of Liberty’s arrival. Lily’s efforts and excitement reflect what Lady Liberty symbolizes to her. This cultural symbol represents hope and freedom for immigrants around the world, including Lily and her family. Through her hard work and dedication, Lily shows that she is proud of her heritage and she is supportive of fellow immigrants who seek freedom and hope. 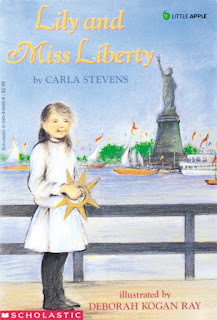 In the story, Lily writes a poem about Lady Liberty’s arrival. I would like to lead students in a discussion about liberty: What does liberty (freedom) mean to you? Students can write their own short poems about freedom, explaining what it means to them and how they experience freedom in their own lives.